Congratulations to Jon for his published image in the September 2007 issue of Sky & Telescope Magazine, p.92. 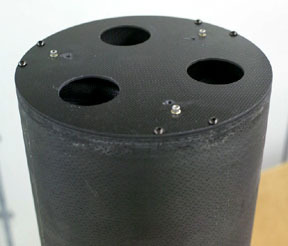 The image was taken with the telescope Jon built using the Dream products he purchased below. Jon is currently (August 2007) testing a 10" f5 complete OTA that Dream produced. It uses a Keller reducer (f3.9 focal plane). A first light image can be seen by clicking the image to the right. 3/9/07 - "My tube arrived in perfect condition yesterday. It looks great and is a real piece of Art. Thanks for the great work in putting it together." Jon T.
5/30/07 - "Here is a link to an image I just finished using the scope I built with the 12" tube you made for me. Also, if you click on the "scope" link it goes to the page I put together showing the building of the scope. I just got it finished this Month. Thanks again for a very well designed tube and mirror cell. It's just awesome." Jon T.
6/2/07 - "The big difference is in tube flex. There is none! I had tube flex with (my original) metal tube version. This tube is rock solid. I have the fans blowing air into the tube from the back and have not had a dew issue yet. They move quite a bit of air but I can't see any vibration noise." Jon T.
Items shipped 3/2/07: Back plate weighs 394 grams, yoke weighs 224 grams and tube weigh approximately 8.0 lbs (49" long). Dream also provided the three high volume fans. 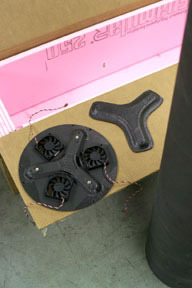 The yoke uses a push/pull design. All bolts are stainless steel. 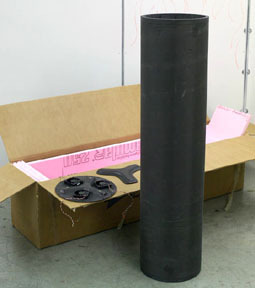 Click here to read comments from a different customer who received a 16" OD carbon fiber tube.